Last week we spent a few days in North Uist, where we’re working with a community steering group on a feasibility study for a potential buy out of the former Lochmaddy Hospital buildings and site. 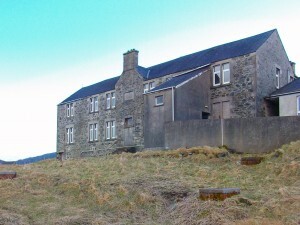 A former poor house constructed in 1883, the buildings ceased use as a hospital in 2001 and have lain empty ever since. 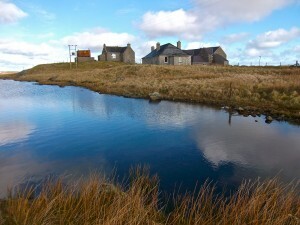 The original stone building is an austere two storey structure which sits a little grimly out on the edge of Lochmaddy. However, it’s an important landmark with a local significance which stretches beyond its physical form. We invited local people to walk around the site and have a look at the buildings. We wanted a first hand impression of how they’d react to getting back up close to this remote and neglected place. It was immediately clear that the site has a cultural and social history which is deeply embedded in the community. Many people were born in the former maternity wing. Others worked there – their names can still be seen on the old nurses lockers in the staff room. Some had elderly relatives who spent their final years as residents. Everyone recognises that the site will never host hospital services again. 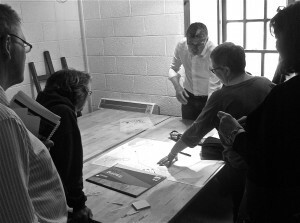 However, there’s an eagerness to find viable new uses for the site. Almost everyone agreed that the original stone building should be retained and refurbished, if at all possible. There are ideas for expanded higher education opportunities in Lochmaddy, building on the success of art courses run locally at Taigh Chearsabhagh. There may be a need for student accommodation and other supporting services. Other opportunities exist for visitor and tourism related uses. It’s likely we’ll need a mix of uses given the size of the site and buildings. In any event, the project must ensure that broad community benefit is delivered if it is to truly succeed. We’re now working through options for the buildings and uses. We report back to the community on 19th May in Carinish Village Hall from 7pm.